In light of the 20th anniversary of the handover, Path of Democracy conducted a public survey and developed an index that aims to calibrate the current state of “One Country Two Systems” (henceforth 1C2S). The Index serves anyone who is interested in the progress of 1C2S. 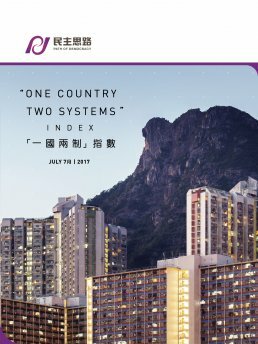 The index’s data is sourced from two components: firstly, we commissioned a telephone survey on 1C2S carried out by the Institute of Asia-Pacific Studies of the Chinese University of Hong Kong; secondly, comparative analysis of Hong Kong with reference to international indices that track aggregate freedom and democracy levels. International indices are important as they provide a global point of reference on the preservation of Hong Kong’s freedom and democracy, which is integral to the implementation of 1C2S. 1.1 With the average score being 4.84 (out of a total of 10). The public has a relatively low rating of 1C2S – a cause for concern for policy makers. 1.2 In terms of self-identification, 55.9% of the public strongly identify as both ‘Hong Kongers’ and ‘Chinese’. 1.3 The public remains deeply divided over whether the current government ought to initiate public consultation for Article 23 legislation. The absence of consensus should be a cause for concern to policy makers. 2.1 This study calculates the ‘Freedom and Democracy’ Index for Hong Kong as the average of 3 components, namely, the ‘Economic Freedom Index’, ‘Personal Freedom Index’, and ‘Democracy Index’ obtained from international indices, and the score is 8.19. This study is the first step in the construction of a 1C2S Index. We seek to refine our data collection and index construction methodologies, and carry out a public survey every 6 months, in order to calibrate the 1C2S Index for the reference of the public and policy makers.